Meringues and Iced Coffee. A Room with a View. When he was introduced he understood why, for Miss Honeychurch, disjoined from her music stool, was only a young lady with a quantity of dark hair and a very pretty, pale, undeveloped face. She loved going to concerts, she loved stopping with her cousin, she loved iced coffee and meringues. At school, I was the type who read the set texts before we went back each January. I have always identified strongly with Hermione Granger, a girl who was comforted and reassured when armed with knowledge. We'd be sent home with our book lists each Christmas - plays for Drama, novels and poetry books for English, textbooks for Science and Maths. I would dutifully stack them in height order, cover them in sticky plastic and, stopping just short of working my way through my Maths book, familiarise myself with all of them. I liked to be prepared. I remember arriving in Year 11 Drama with a colour-coded, detailed outline of Much Ado About Nothing, including all of my favourite quotations and the reasons why Beatrice was the most exciting part in all of Shakespeare's works (I still believe this). And so, when I was 14, I spent the summer reading and re-reading Forster's A Room with a View, which was on my Year 10 reading list. I completely adored it We'd won a trip to Europe two years earlier, and I'd spent a week in Tuscany blown away by the beauty of the vineyards, the architecture and the food. I could well imagine how it might encourage one to do crazy things, like snog a young man you hardly knew when on a picnic. I was desperately romantic at that age. I had just had my first 'proper' kiss, with some Year 11 lad in a white singlet (his name now escapes me) while 'Hey Mickey' blasted from the speakers at a school dance. I spent the summer reading Sense and Sensibility and Jane Eyre, alongside A Room with a View, and I wanted more than anything to fall in love myself. George Emerson seemed an ideal candidate, and I couldn't imagine anything better than being Lucy Honeychurch. I returned to school for Year 10, the book under one arm, eagerly anticipating discussing it at length. I've picked it up many times since. The quote that inspired these meringues is part of one of my favourite character assassinations in any book. Mr Beebe, the local Reverend, having just been transported by Lucy's passionate performance of Beethoven on the piano, is desperate to meet her. He is disappointed to find that she 'loved' his sermons, and is, when in Italy, dependent on her Baedeker. He sees beyond this, and memorably states: "If Miss Honeychurch ever takes to live as she plays, it will be very exciting both for us and for her". What follows is us watching her start, inch by inch and then finally with a big leap, to do just this. Before she does though, she is the sort of young woman who likes meringues and iced coffee. At the risk of labelling myself a 'basic' Lucy Honeychurch - for this, of course, as my friend Sarah pointed out on Twitter, is what Me Beebe (and Forster) is saying - I love meringues and iced coffee. And so, last week, I made some. They were just lovely. Basic, in the best possible way. 1. Preheat the oven to 100C. Rub the slice of lemon around the inside of the bowl, getting rid of any traces of fat. Tip the egg white into the bowl and whisk until it forms stiff peaks. 2. Continue to whisk on a low-medium speed, adding the caster sugar one spoonful at a time. When the meringue forms glossy, stiff peaks, and the sugar has dissolved, transfer it to the piping bag. Line the baking tray with greaseproof paper and snip a half-centimeter hole in the piping bag. 3. Hold the piping bag at a 90 degree angle to the baking tray, and pipe little meringues, 2cm in diameter. I think they end up looking lovely if you keep the piping bag close to the tray, and allow the meringue to spread from a central point, rather than swirling it around. Make them stand proud by slowly pulling the bag away from the board, squeezing all the time. They're not going to spread, but do give them a little breathing room. 4. Bake the meringues for an hour, until crisp on the outside and still soft in the middle. Turn the oven off, and leave to cool in the oven for another hour. Meanwhile, make the coffee and pop it in the fridge. 5. Whisk the cream until soft and use it to sandwich the meringues together (try and pair similar sizes if you're a bit rubbish with consistency - as I was). If you'd prefer jam or icing or something else instead, then use that instead. 6. Add some ice to a glass and pour the chilled coffee over the top. Add a dash of milk or cream, stir, and enjoy with the meringues. 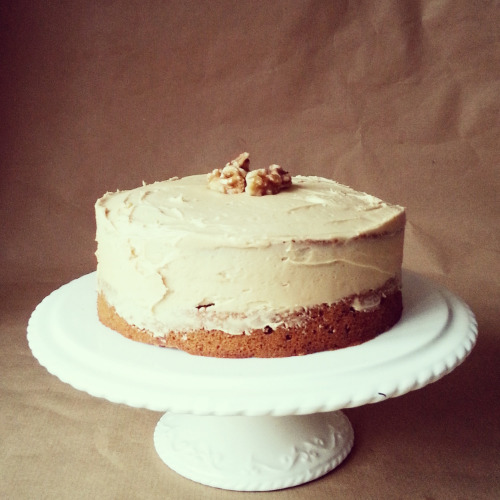 Coffee and Walnut Cake. The Remains of the Day. I am at present sitting in its spacious tea-room, oak-panelled, with enough tables to accommodate, I would guess, two dozen people without a feeling of crowding. Two cheery young girls serve from behind a counter displaying a good selection of cakes and pastries. All in all, this is an excellent place to partake of morning tea, but surprisingly few of the inhabitants of Taunton seem to wish to avail themselves of it. My favourite thing to do while cooking (or taking a very long bath) is to continue working my way through the Desert Island Discs archive. If you're not aware of the programme, it asks its guests to list the eight 'tracks' they would take with them if marooned on a desert island. Kirsty Young, the current host, then speaks to them about their life, their career and their music choices. There are some real gems on the archive - episodes I could listen to over and over. If you've been reading this blog for a while, you'll know I'm also a big fan of Nigel Slater, whose books are forever in use in my house. His interview on Desert Island Discs also sees him being prompted for his desert island dish - and his choice of coffee and walnut cake and a cup of tea is one I tip my hat to. It's not necessarily what I'd choose (that would perhaps be something more akin to the meal I describe in this post), but there are few cakes more comforting than a classic coffee and walnut. After listening to the episode, it stayed in my mind; I hadn't made one in ages and decided I had to find a use for it on this blog. Happily, while reading The Remains of the Day for book club last month, I immediately felt that this cake would be very much at home in the tea-room Stevens visits in mid-century Somerset. In a nod to the coffee and walnut master, I've adapted Nigel Slater's recipe below. ps. If you're new to Desert Island Discs, do yourself a favour in the next couple of weeks and listen to their Christmas special. It's a real treat. *I'm a horrible coffee snob, so feel a little funny suggesting you buy some instant coffee. However, it's absolutely right here - I tested this against one flavoured with a proper espresso, and the flavour of the instant coffee in the cake came out on top. 1. Ensure all ingredients are at room temperature, and preheat the oven to 180C. Grease the sandwich tins with butter and line the bases with greaseproof paper. 2. Beat the butter and sugar until very fluffy and nearly white in colour (it takes longer than you think, especially as you've started with golden sugar, but is worth it for the lightness of the sponge). Add the eggs on at a time, beating well between each addition. Sieve the flour and baking powder into the mixture and fold through. Add one tablespoon of boiling water to the coffee granules, then fold through the mixture, along with the walnuts. 3. Split the batter evenly between the tins, smooth the tops, then bake in the oven for around 20 minutes, until a cake inserted in the centre comes out clean. 4. While the cakes are baking, beat the butter for the icing until smooth, fold the icing sugar through the butter (to prevent it going everywhere in your kitchen - which it will do if you just pour it in), then beat together until fluffy. Add a tablespoon of boiling water to the coffee granules, dissolve the coffee, then beat it into the icing. Place a third of the icing in a separate bowl, and fold the walnut pieces through it. 5. When the cakes are baked, remove from the oven and allow them to cool in their tins for five minutes, before transferring them to the cooling rack. 6. Once cool, place one of the cakes on a serving plate and top with the walnut-laced icing. Place the second cake on top and ice the top and sides with the non-walnut icing - I prefer leaving the base of the cake exposed, as you can see above. Serve in large slices with a cup of tea.